On a balmy April's Fool evening in 1987, near the shores of Lake Ponchatrain, eleven businessmen gathered at Benny Delauzin's home to form a new carnival Krewe that would bring a first-class parade to Mandeville. The ladies Original Krewe of Orpheus had successfully paraded the year before. 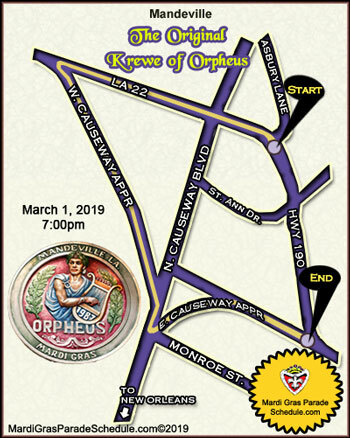 By February 12th, Orpheus had grown to 225 men, and paraded for the first time on the Friday night before Mardi Gras in l988 with thirteen floats and as many local and regional marching bands. Reaction was overwhelming - both from riders and parade goers. Riders who had ridden in other parades in New Orleans were amazed that folks here actually say "Thank You" when tossed beads or other throws. The family orientation of parading in Mandeville was a pleasant departure for many seasoned riders who were used to rowdy crowds and big city hassles. The public and press declared Mandeville's new Krewe a "great success" and the Organization grew into the Northshore's premier men's carnival organization. Quality and quantity are stressed in the "throws" department, with the generous Krewe creating their own throws throughout the years. During an early Board of Directors discussion of throws, Roger Farris opined that it would be cool to have an indigenous Krewe throw. Webb Williams went home and began the development of a pinecone sprayed purple, green and gold, sprinkled it with gold glitter and glued a gold doubloon to its base. Legend has it that those who catch an Orpheus Pineloon and display it in their home will experience good fortune all year long. Now, parade goers hold up signs asking for the special throw. Float members get together in the months preceding the parade and have Pineloon parties, at which some pineloons actually get created. It has become as popular as the coconut is to Zulu. 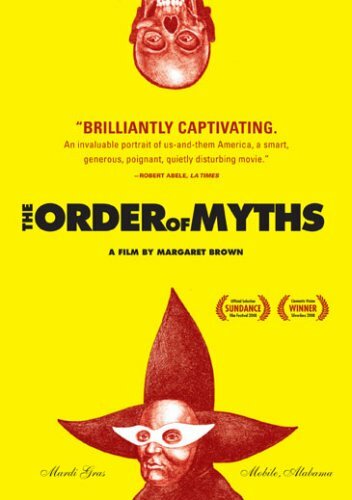 The offical call and response of the hearty Krewe is: "HAIL ORPHEUS" "HAIL YES"
The original Orpheus eleven: Doug Baker "Captain", Kerry Burst, Bill Cox, Jack Cressend, Benny Delauzain, Roger Farris, Howard Hodes, Grant Macdiarmid, Ed Parker, Art Rahn and Webb Williams.